The South Central Oregon Fire Management Partnership is an interagency fire management program that provides comprehensive wildland fire service to south central Oregon and northwest Nevada. The partnership strives to achieve a more efficient, effective and integrated interagency fire management program for all participating agencies on the land administered and protected by each agency. Dispatching is performed by the Lakeview Interagency Fire Center (LIFC). The mission for Lakeview Interagency Fire Center (LIFC) is to provide high quality service to all of our partner agencies in the most efficient and cost-effective manner possible while providing for firefighter safety at all times. All actions will be consistent with land and resource management objectives and current incident management direction. Lakeview, Oregon - Spring weather has arrived in South Central Oregon, and fire managers on the Fremont-Winema National Forest, and Lakeview District Bureau of Land Management will be applying prescribed fire to the landscape. Warmer temperatures, reduced snow pack, adequate humidity and favorable winds are improving the conditions needed for firefighters to start applying fire to planned units. Area residents and visitors may notice smoke or fire on public lands in various areas during the next few months. Each prescribed fire can appear different visually depending on the forest type, fuel load, prescribed fire objectives, and how long fire has been absent from the area. Areas where prescribed fire operations are taking place will be well signed, and may have increased fire personnel, traffic, and smoke in the area. Please stay clear of these areas when possible for public and firefighter safety. 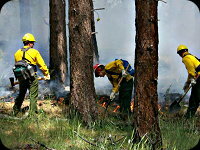 Prescribed fire occurs on days when the Oregon Department of Forestry Smoke Management Office indicates there are suitable weather conditions for smoke dispersal. Following that approval, if overall fuel and weather conditions are favorable, firefighters ignite a test fire before moving forward with the prescribed fire. If the test fire indicates conditions are not suitable, the prescribed fire will be postponed until conditions improve. All burning operations are monitored and patrolled frequently, by fire professionals, to ensure public safety. Prescribed Burn Notices will be posted prior to ignition once timeframes have been established. SCOFMP employees are committed to a safe and successful prescribed fire season for the public, and employees within these designated areas. For more information please contact the listed host for each individual prescribed fire, or get our most recent updates online at scofmp.org/lifc.shtml, on Facebook at facebook.com/SCOFMPFireInfo, and on twitter at @SCOFMPFireInfo.